Ballpark Commons in Franklin, Wisconsin just became a golfer's paradise. Luxe Golf Bays announced they would be installing a three-level entertainment center with 57 heated open-air bays overlooking 215 yards of driving range turf at 7900 Crystal Ridge Road just off Highway 36. They expect to open during the summer of 2019. It's the first of its kind in the Midwest, and this location will be the flagship for seven to ten Luxe ranges planned within the next decade. 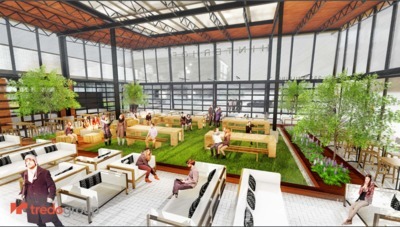 The facility will cost $15 million dollars and also feature a 2,500 to 3000 foot event space, two local restaurants and a four-season beer garden. Inside each private golf bay, golfers will have a full-screen TV and a fully furnished suite of furniture to relax during swings. Golfers will also have access to the sports highest technological amenities. Luxe deploys Doppler radar ball tracking, swing data analysis, and a gaming platform that allows cross play between friends on some of the world's most famous courses. Amateur golfers are also welcome. Luxe will have certified pros on staff to teach lessons and they offer leagues of varying levels throughout the year for casual or competitive golfers. As for food, the "Hinterhorf" beer garden will have a retractable roof and act as an open air gathering space during the summer.